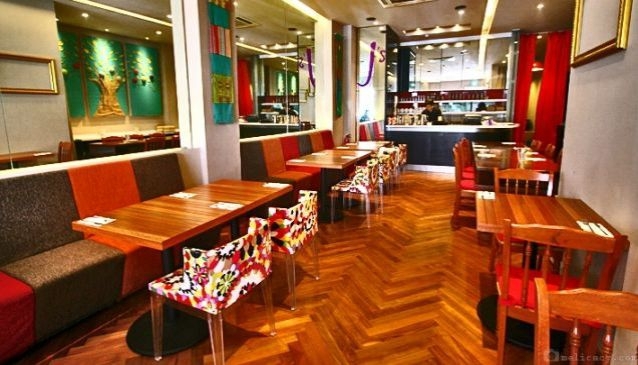 Enjoy a semi-fine dining experience at J's Restaurant on the trendy Purvis Street. Executive chef, Darence Wee designed a menu of Modern European cuisine with Latin American influence. Prime your taste buds with the signature dishes of Chicken 'Adobo' and the 120-day grain-fed sirloin of beef, but also paella, quesadillas and fajitas, enchiladas and burritos. Then satisfy your sweet tooth with a mouth-watering dessert menu with the ever-popular 'Bocas Negras' flourless chocolate cake that comes with fresh berries, chocolate ice cream and pistachio tuille while the 'Peppered Pineapple' is served with ginger gelato & vanilla caramel syrup. The menu caters for both Vegetarians and Muslims as neither alcohol and pork products can be found on the menu.